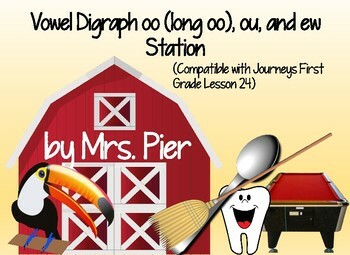 Are you looking for a rigorous phonics station for your students? Would it be convenient if it was compatible with the Journeys curriculum? If so, then this is the perfect product for you! 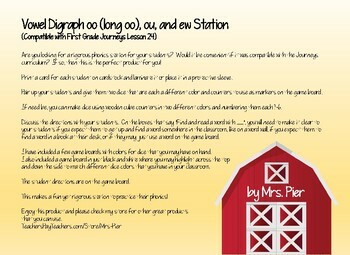 Print a card for each student on cardstock and laminate it or place it in a protective sleeve. Pair up your students and give them two dice that are each a different color and counters to use as markers on the game board. If need be, you can make dice using wooden cube counters in two different colors and numbering them each 1-6. Discuss the directions with your students. On the boxes that say “Find and read a word with ___”, you will need to make it clear to your students if you expect them to get up and find a word somewhere in the classroom, like on a word wall, if you expect them to find a word in a book at their desk, or if they may just use a word on the game board. I have included a few game boards with colors for dice that you may have on hand. I also included a game board in just black and white where you may highlight across the top and down the side to match different dice colors that you have in your classroom. The student directions are on the game board. 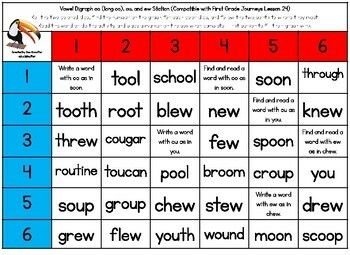 This makes a fun yet rigorous station to practice their phonics!